One of the beauties of Highland Park is its calm and quiet neighborhoods. In recent years, this tranquility has been interrupted by the sound of leaf blowers. Generating noise at sometimes four times or more the noise of a passing car, leaf blowers can impact quality of life by interfering with the peace and quiet of our neighborhoods. Working neighbor to neighbor, we all can play an important role in helping to keep our neighborhoods quiet. To view a few helpful reminders by landscape crews in being courteous and respectful to all of our neighbors, visit the leaf blower information page. A noise complaint about leaf blowers may be filed online at HP4U, the Highland Park Resident Connection, by selecting the topic “Leaf Blower Complaint.“ A letter will be mailed to the resident informing of the complaint and offering informational tips on how their landscape crew can reduce the noise caused by leaf blowers. The Town is currently evaluating various battery-operated leaf blowers for sound and performance assessment. Initial results have been promising with the units operating below 70 decibels (dB) and battery life lasting around two hours. Pending a final assessment, the Town may likely begin using battery-operated leaf blowers in its role of being a good neighbor. Results of the evaluation will be provided to lawn care companies for comment and consideration of use. 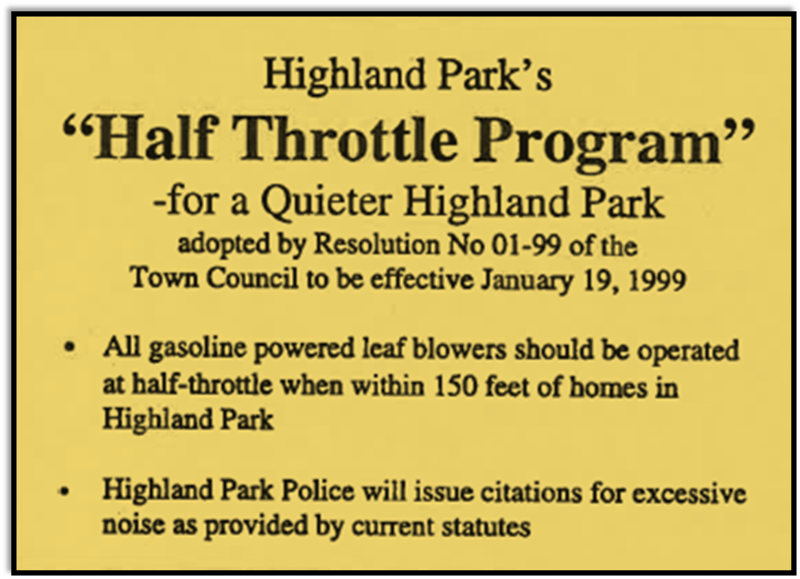 Recognizing leaf blowers can be notoriously noisy,in 1999, the Town Council adopted a resolution promoting the voluntary operation of leaf blowers at “half-throttle” speed. The lower speed was selected as a way to minimize the sound of leaf blowers. The policy is a cooperative effort by the Town and landscape companies. On a periodic basis, the Town mails information about the voluntary program to known landscape companies. In addition to this work, the Town also distributes pamphlets to landscape crews when seen using leaf blowers.